Since 1993, Brisbane, Australia has hosted a remarkable and unique cultural event: the Asia Pacific Triennial of Contemporary Art. The eighth instalment opened in November 2015 at the venerable Queensland Art Gallery and its shiny young neighbour the Gallery of Modern Art. Two years ago I wrote about Brisbane and a spectacular exhibition of Cai Guo Qiang’s work. A recent visit to APT8 only confirms my feeling that, when it comes to contemporary art, Brisbane is one lucky city. The visit also confirms my suspicion that being a great tour guide is no mean feat. I joined six different tour groups over four days, and the experiences ran from terrific (reminding me that contemporary art from unfamiliar lands is complex, diverse, and important to us all) to, um, not terrific (in which the wacky material used is the most interesting element) (in which every work of art is subversive, deconstructive, challenging someone’s gaze, or making something new) (leaving me fearful that all art of my lifetime is a sham). It can’t be easy showing strangers around an exhibition that includes 83 artists from 36 countries, from New Zealand to Mongolia to Iran. But having a theme helps; and you can guess what my theme is. Though migration isn’t the exhibition’s most prevalent motif—that would probably go to recycling, with identity a close second—the show includes a strong group of works that bring to life the complex forms of migration in our century’s second decade. Here’s a whirlwind tour of some of those works. If you can’t make it to Brisbane before 10 April, keep these works in mind for future visits: wily GOMA has already acquired most of them. Hit Man Gurung, 9:11am (2015) and Yellow helmet and gray house (2015). I’ll start my tour with two works by Nepalese artist Hit Man Gurung that are powerful reflections on migrant workers in the Middle East. Yellow helmet and gray house (2015) is a diptych: on the left side, a monumental, battered construction helmet looms over a grid of recent Persian Gulf skyscrapers; on the right, an elderly couple confront the viewer, holding up the cancelled passport of their son, killed while working in Saudi Arabia. Behind them appears a repeated image of the titular house these bereft parents built with the insurance money. In Gurung’s compact narrative, different edifices arise, two thousand miles apart, as memorials to Nepal’s migrant work force. A second work, 9:11am (2015), shows an exhausted Nepalese construction worker holding a pristine football labelled “Bidding Nation Qatar.” Behind him are images of devastation from the 25 April 2015 Kathmandu earthquake. The man, his face covered in sweat, eyes red from the dust, looks just beyond us, as if lost in thought at the enormity of the tragedy. Is this a resident of Kathmandu, contemplating the thousands of Nepalese far from home and unable to assist in the recovery efforts? Or a worker in Qatar, building a new football stadium, powerless to return to aid his family and community? (it was the inauspicious time of 9:11am in Qatar when the earthquake hit Kathmandu). Actually it’s a portrait of the artist occupying both awful positions. Gurung uses specific tragedies from his homeland’s recent history, but their resonance is global. He pinpoints the irony of nations constructing iconic structures, built to induce national pride but enabled by the poverty of other nations. And he makes the important and too-often forgotten point that immigration is far too often a poor land’s loss. Angela Tiatia, Edging and seaming (2013). Collection: Queensland Art Gallery. 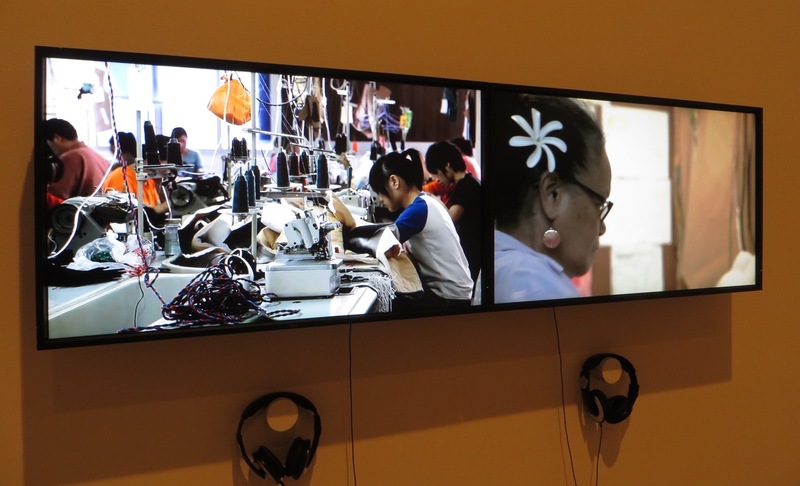 Nearby, Sydney-based New Zealand artist Angela Tiatia’s video Edging and seaming (2013) offers another kind of meditation on work and migration. The left screen shows a modern clothing factory filled with young men and women in Guangzhou, China. The right screen presents a lone, older woman of Pacific heritage doing similar work in a much smaller, more personal space. We only hear her soundtrack, including the late-night Auckland radio station playing in the background. Based on the visuals, the work presents two visions of contemporary manufacturing, one expanding, the other fading. The impact is more profound when we learn that the lone woman is the artist’s mother, who had immigrated to New Zealand many years ago to work as a clothes manufacturer. We watch her completing a last order because the work has been outsourced to a factory in China. The video’s power comes from the artist’s restraint. Though personal touches — streams of tinsel, a Robbie Burns mug — draw us to the elder Ms. Tiatia, there’s no sense of judgement of the Chinese workers, many of whom would have migrated from small towns all over southern China for economic reasons, similar to the artist’s mother. The work’s title, with its connotations of borders and contact points, calls attention to an industry that (one might say) seamlessly hides its labour and transport; after all, we may be wearing the very clothes being created. It also nicely suggests the way our own national identities are stitched together. Up on the third floor, Anida Yoeu Ali’s video contribution offers a whimsical and ambiguous vision of the returning migrant. Ali came to the United States as a refugee from Cambodia. 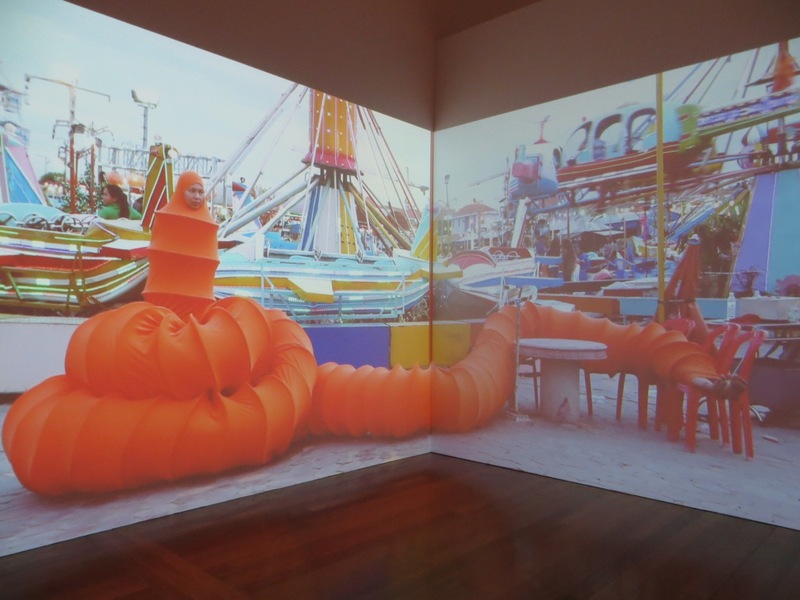 In The Buddhist Bug, Into the Night (2015), she adopts the outrageous costume of a giant orange caterpillar to suggest the strangeness of the returning migrant’s experience. We see the Bug at an amusement park, zipping around Phnom Penh on a scooter (seemingly powered by her synth-driven theme song), contemplating the denizens of discos and karaoke bars (one with the sinister name Heart of Darkness). When the camera focuses on Ali’s head and shoulders, her garb brings to mind the shape of a hijab and the colour of a Buddhist robe, suggesting the Bug as some sort of moral presence in a troubled city. But is this presence transformative or limiting? The caterpillar’s metamorphic possibilities encourage the former reading, but the constrictive costume suggests the latter. The Buddhist Bug’s expressions run from curiosity to distress, but rarely pleasure or amusement. Passersby seem surprisingly tolerant of this alien appearance. Ali’s work suggests the challenges contemporary society throws at the individual — whether separated by their physical appearance or spiritual beliefs — and the special challenges of the twenty-first-century migrant, unable to fully return to her former homeland. New Zealander Luke Willis Thompson and Fiona Amundsen’s sucu mate (2012-15) get the “Stay Tuned” award for most promising idea. Thompson has been studying the estate cemetery of a former sugar plantation in Lautoka, Fiji. The cemetery’s divisions repeat in perpetuity the nineteenth-century division of labour and ethnicity between the wealthy landowners and the Cantonese indentured servants. Such an investigation might explore the complex history of a former British colony and its contemporary Chinese, Indian, and Fijian communities. It might also reflect on China’s recent return as a political and economic influence in the Pacific. Thompson’s contributions to APT8 are a series of nine undistinguished photographs of grassy spots, presumably taken at the overgrown cemetery grounds, and a larger, seventh image of nine tombstones in two piles, presumably removed from those grassy spots. Even with the accompanying description, and knowledge that other versions of the work have been shown elsewhere, the photographs give us little to work with. This feels like a fascinating work in progress but also a missed opportunity. Gulnara Kasmalieva and Muratbek Djumaliev, A New Silk Road: Algorithm of Survival and Hope (2006). 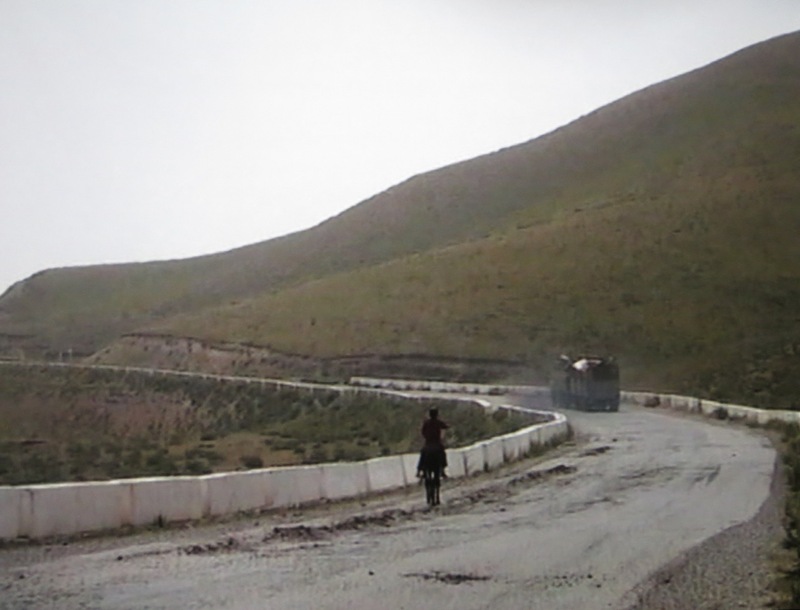 A more successful meditation on history and migration is a ten-minute film on five screens by Gulnara Kasmalieva and Muratbek Djumaliev from the Kyrgyz Republic, A New Silk Road: Algorithm of Survival and Hope (2006). Like Edging and Seaming, the film works in part because its creators avoid (save in the subtitle) didacticism. An ancient trade route that once carried silk, porcelain, and spices is today populated by rusty Kyrgyz trucks, loaded with scrap metal from Soviet-era buildings and machinery, crossing the border into China, where they exchange their refuse for Chinese-made clothes and whiteware. Meanwhile, clean and colourful Chinese trucks make the journey in the opposite direction. We witness the backbreaking work of sorting through old metal and of packing the new goods for travel, but we also see the workers at rest along the journey. At one of these twenty-first century oases, workers wash down their trucks, musicians sing a folk song, and local children play ball. The camera lingers on the empty seat of a metal swing just long enough so that its meaning flickers in our minds: a child’s beloved object, or future scrap metal. In the final scene, trucks go by on all five screens, leaving behind in the centre screen a reminder of the ancient silk road: a single horseman. As the image fades, the sound of the trucks rises. Uh oh, just look at the time! Or word count. Editors, like tour groups, have short attention spans. So I’ll just encourage you to visit the three rooms in the Queensland Art Gallery that have been curated and reimagined by Australian artist Brook Andrew. He’s done something extraordinary: taken some of the museum’s nineteenth-century Australian colonial paintings and made them look alien in their own home, simply by changing what’s on the walls behind them. European Australians and their imaginative worlds have never looked so out of place. But you’re just going to have to see it for yourself. ← Is bitcoin the new way to buy a new roof for your family back home?